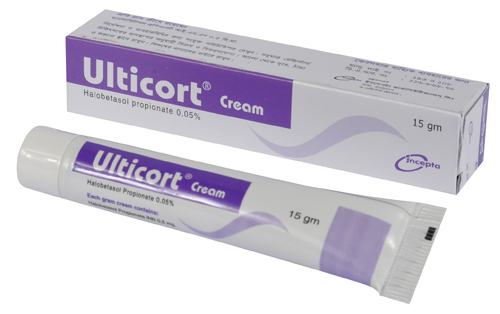 Ulticort Cream: Each gram Ulticort cream contains Halobetasol propionate 0.5 mg.
Halobetasol propionate has anti-inflammatory, antipruritic and vasoconstrictive actions. A thin layer should be applied to the affected skin once or twice daily, as directed by physician, and rub in gently and completely. Treatment beyond two consecutive weeks is not recommended, and the total dosage should not exceed 50 g/week because of the potential for the drug to suppress the hypothalamic-pituitary-adrenal (HPA) axis. Use in children under 12 years of age is not recommended. Halobetasol Propionate Cream should not be used with occlusive dressings. As with other highly active corticosteroids, therapy should be discontinued when control has been achieved. If no improvement is seen within 2 weeks, reassessment of the diagnosis may be necessary. Safety and effectiveness of Halobetasol Propionate cream & ointment in paediatric patients have not been established. Paediatric patients are at greater risk than adults of HPA axis suppression when they are treated with topical corticosteroids. The following adverse effects have been reported infrequently with topical corticosteroids. These reactions include burning, itching, dryness, folliculitis acne, hypopigmentation, perioral dermatitis, allergic contact dermatitis, skin atrophy, secondary infections, striae and miliaria. Systemic absorption of topical corticosteroids may cause reversible hypothalamic-pituitaryadrenal (HPA) axis suppression, manifestations of cushing\'s syndrome, hyperglycemia, and glucosuria. Patients receiving large dose of a potent topical steroid applied to a large surface area or under an occlusive dressing should be evaluated periodically for evidence of HPA axis suppression by using the urinary free cortisol and ACTH stimulation tests. If HPA axis suppression is noted, an attempt should be made to withdraw the drug, to reduce the frequency of application, or to substitute a less potent steroid. Topical corticosteroids should be used during pregnancy only if the potential benefit justifies the potential risk to the fetus. It is not known whether topical administration of corticosteroids could result in sufficient systemic absorption to produce detectable quantities in breast milk. Therefore caution should be exercised when topical corticosteroids are administered to a nursing woman.